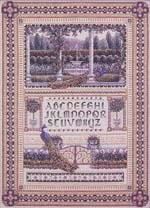 Model size: 21.75" x 15.5"
Description: A very large, intricate sampler featuring architectural elements and motifs inspired by formal English gardens. A tranquil garden scene with a fountain and a peacock is framed by rose-covered marble pillars. The Old English style alphabet is stitched over one in shades of green, and is flanked by two topiary trees. Another peacock perches atop marble fencing closed with a gold filagree-work gate; flowers complete the scene near the bottom of the sampler. The main scenes are separated by bands of specialty stitch motifs. The design is finished with a wide border which includes cut-work, specialty stitches and beads. Background Information: This piece was originally meant to compliment the English Cottage Sampler, but instead, became so much more elaborate and involved, that the designs bear very little resemblence to each other...they are totally different in style. The overall composition is appropriately formal - very "balanced", and, as is the case with most of my sampler designs, I added "tension" or "visual interest" to the design by overlapping: the topiary trees' foliage, the peacocks' tails, the greenery in the urns, etc... I incorporated everything I could think of into this design, in part, just to see if I could do it successfully...I guess it worked: this design received a Golden Needle Award in 1994. Stitching Comments: Let there be no mistake: this design is BIG. But, in complexity, it is not as difficult as some of my other designs...and the chart is computer generated, (and in booklet form, so you won't be overwhelmed by the spectacle of a huge fold-out chart!) If you are willing to invest the time in organizing your materials before you begin, and to keep yourself organized during the stitching process, I think you'll find this design a true accomplishment when completed.